The Kabardino-Balkar Republic (Russian: Кабарди́но-Балка́рская Респу́блика, Kabardino-Balkarskaya Respublika; Kabardian: Къэбэрдей-Балъкъэр Республикэ, Ķêbêrdej-Baĺķêr Respublikê; Karachay-Balkar: Къабарты-Малкъар Республика, Qabartı-Malqar Respublika) or Kabardino-Balkaria (Russian: Кабарди́но-Балка́рия, Kabardino-Balkariya), is a federal subject of Russia (a republic) located in the North Caucasus. As of the 2010 Census, its population was 859,939 on 12,500 square km. Its capital is Nalchik. The republic is situated in the North Caucasus mountains, with plains in the northern part. 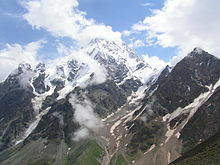 Kabardino-Balkaria is traversed by the northeasterly line of equal latitude and longitude. Kabardino-Balkaria's natural resources include molybdenum, tungsten, and coal. The republic has a continental type climate. Average annual precipitation: 500–2,000 mm. Note: TFR 2009, 2010, 2011, 2012 source. 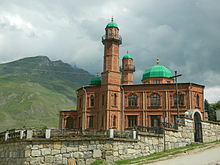 Kabardino-Balkaria includes two major ethnic communities, the Kabardins (Circassians), who speak a North-West Caucasian language, and the Balkars who speak a Turkic language. According to the 2010 Census, Kabardins make up 57.2% of the republic's population, followed by Russians (22.5%) and Balkars (12.7%). Other groups include Ossetians (1.1%), Turks (1.6%), Ukrainians (0.6%), Armenians (0.6%), Koreans (0.5%), Chechens (0.2%), and a host of smaller groups, each accounting for less than 0.5% of the total population. 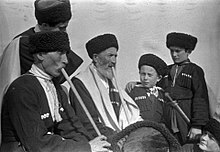 1 The results of the 1926 census refer to the present territory, which is a combination of the Kabardo-Balkar AO and a part of the Terek district. The latter area was mainly inhabited by Russians and Ukrainians. 2 In view of the results of the 1989 census and the 2010 census, the number of Kabardins in 2002 seems unlikely high. 3 2,269 people were registered from administrative databases, and could not declare an ethnicity. It is estimated that the proportion of ethnicities in this group is the same as that of the declared group. According to a 2012 survey which interviewed 56,900 people, 60% of the population of Kabardino-Balkaria adheres to Islam, 15.6% to the Russian Orthodox Church, 3% to Adyghe (Kabardian) folk religion and other indigenous faiths, 5% are unaffiliated generic Christians. In addition, 12% of the population declares to be "spiritual but not religious", 5.4% is atheist or follows other religions including Jehovah’s Witnesses. The head of government in Kabardino-Balkaria is the Head. The current Head is Kazbek Kokov. The legislative body of the Republic is the Parliament comprising 72 deputies elected for a five-year term. ^ "Путин опять увольняет губернаторов, а на их место назначает однофамильцев или бывших губернаторов. А-а-а! Как не запутаться? Вот шпаргалка". 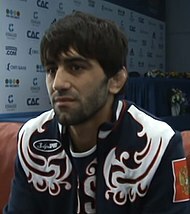 Meduza (in Russian). Retrieved 2018-09-26. Совет Республики Парламента Кабардино-Балкарской Республики. Закон №13-РЗ от 4 августа 1994 г. «О государственном гимне Кабардино-Балкарской Республики», в ред. Закона №13-РЗ от 13 апреля 2015 г «О внесении изменений в статьи 2 и 4 Закона Кабардино-Балкарской Республики "О государственном гимне Кабардино-Балкарской Республики"». Вступил в силу 18 августа 1994 г. Опубликован: "Кабардино-Балкарская правда", №148, 12 августа 1994 г. (Council of the Republic of the Parliament of the Kabardino-Balkar Republic. Law #13-RZ of August 4, 1994 On the State Anthem of the Kabardino-Balkar Republic, as amended by the Law #13-RZ of April 13, 2015 On Amending Articles 2 and 4 of the Law of the Kabardino-Balkar Republic "On the State Anthem of the Kabardino-Balkar Republic". Effective as of August 18, 1994.). Парламент Кабардино-Балкарской Республики. №28-РЗ 1 сентября 1997 г. «Конституция Кабардино-Балкарской Республики», в ред. Закона №40-РЗ от 19 октября 2015 г. «О поправках к Конституции Кабардино-Балкарской Республики». Вступил в силу со дня официального опубликования. Опубликован: "Кабардино-Балкарская правда", №177, 9 сентября 1997 г. (Parliament of the Kabardino-Balkar Republic. #28-RZ September 1, 1997 Constitution of the Kabardino-Balkar Republic, as amended by the Law #40-RZ of October 19, 2015 On the Amendments to the Constitution of the Kabardino-Balkar Republic. Effective as of the day of the official publication.). Дударев, В. А.; Евсеева, Н. А. (1987). И. Каманина, ed. СССР. Административно-территориальное деление союзных республик (in Russian). Moscow.